Asia’s two biggest economic powers continue to struggle to find common ground. Following their assertive actions in the East China Sea in recent years, Chinese foreign policymakers now find themselves under considerable pressure. China’s expansionist strategies in the East and South China Seas have earned Beijing widespread criticism from the international community. One of Wang’s demands is related to the one-China policy. China is keeping a careful watch on President Tsai Ing-wen’s new administration in Taiwan and is wary of Taiwan and Japan forging closer ties. Even after China adopted policies to improve cross-strait relations, Taiwan public opinion has been trending against “unification.” Beijing’s frustration is growing. Worse is the ruling from the Permanent Court of Arbitration at The Hague addressing competing claims between the Philippines and China in the South China Sea. China refused to participate in the arbitration process, claiming the tribunal lacks jurisdiction. The ruling handed down last week was highly unfavorable to Beijing, and complicates its diplomacy considerably. The Chinese government has explained that its foreign policy is a response to America’s Asian rebalance or Japan’s antagonistic foreign policy. From a Japanese perspective, Beijing’s apportioning of blame looks to be a case of confusing cause and effect. China’s assertive behavior had initially stirred Japanese anxiety and was reflected in Japan’s foreign and security policy. The ruling coalition of the Liberal Democratic Party and Komeito won the Upper House election in July. One reason why a majority of Japanese voted for the ruling party was concerns about China and support for the Abe administration’s foreign policy. As long as China maintains a foreign and security policy that pursues its own interests in adopting “salami-slicing” tactics in surrounding areas, it will be difficult to eradicate Japanese distrust of China. On the other hand, some Chinese officials and intellectuals have expressed dissatisfaction about the slow response of the Japanese government to its efforts to improve the bilateral relationship. For example, China invited Japan to join the AIIB, but Japan declined. In the past when Japan-China relations have deteriorated, China has suspended communications in all areas. Japan has called for “separate politics and economics” (seikei bunri) with China to prevent relations from worsening, while hinting at ways the two might improve relations. A large majority of Japanese want a peaceful settlement of the problems and a stable relationship with China, even if they don’t have a favorable impression of China at present, and basically support the idea of seikei bunri. Still, Japan sometimes struggles with the policy as new problems emerge. Japan-China relations have been through rocky patches in the past, whether because of historical issues or economic friction, but the current concerns in Japan are unique. Since the late 2000s, China has come to pose a physical threat to Japan. Another challenge of seikei bunri for Japan is that China converts its economic power to diplomatic influence, tries to gain support for its policies from other countries, and then seeks to foment division. These emerging challenges have prompted the current debate in Japan about how best to respond to China. The Abe administration, which enjoys a stable majority in the Diet, will continue its policy of bolstering Japan’s defense capabilities and stepping up security cooperation with other countries. Yet Japan will also seek cooperation with China where possible. After all, in this era of globalization, two countries as interdependent as Japan and China are cannot simply ignore one other – they must manage relations in their own and regional interests. Many Chinese assume that Japanese are uneasy or jealous about China’s rise and want to impede China’s development. That ignores the fact that many Japanese who were originally positive about China’s development look harshly on China’s recent behavior. Chinese leaders emphasize the “great rejuvenation of the Chinese nation,” but when weighing those remarks against China’s actual behavior, Japanese get the impression China wants to revive the Chinese empire and an ancient order in Asia. That sort of revisionism is of course anathema to Japan. 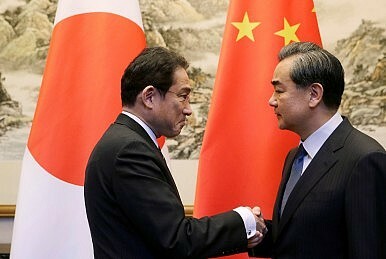 Without question, China’s development both excites and presents opportunities to other countries, including Japan. But what Japan and other countries in the region seek from China is not a revival of the Chinese empire of ancient times, but rather the emergence of China as a great power of the 21st century. Hiroko Maeda is a Research Fellow at the PHP Institute. Japan is lobbying for a high-level visit this weekend despite a lack of concessions. Is This a True Thaw in Sino-Japanese Relations?Abe Wants 'New Era' in China-Japan RelationsChina-Japan Reset Continues With High-Level Economic TalksJapan, China Agree to Implement East China Sea Crisis Management HotlineAre China and Japan Moving Towards a Rapprochement?